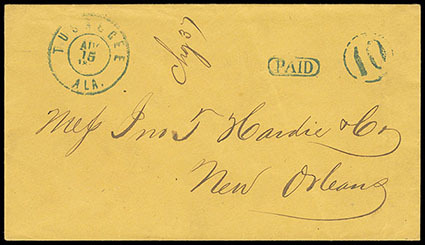 Confederacy, (Alabama) Tuskeegee Ala. Aug. 15, 1861, blue-green double-circle datestamp with matching "Paid" in oval and "10" in circle rating handstamps on orange buff cover to New Orleans La., manuscript "Chg 37" charge box notation, Very Fine and choice, This is the CSA listing example. C.S.A. Catalog No. B; $200 Estimate $150 - 200. 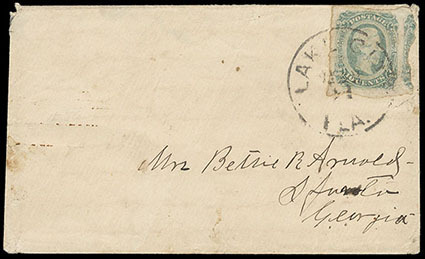 Confederacy, (Arkansas) Helena, Ark., Dec. 7, 1861, double circle postmark with "PAID 10" on cover sent to New Orleans, La., Fine. Confederacy, (Arkansas) Helena, Ark. 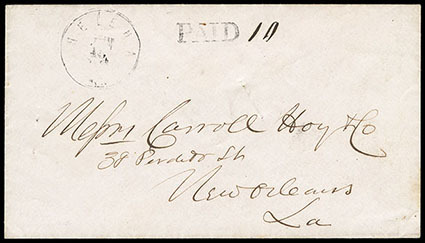 Jun 15, 1861, double-circle datestamp with matching "PAID" handstamp and manuscript "10" cent rating on Carroll Hoy & Co. correspondence to New Orleans La. ; flap trimmed, Very Fine and scarce. C.S.A. Catalog No. A; $400 Estimate $200 - 300. 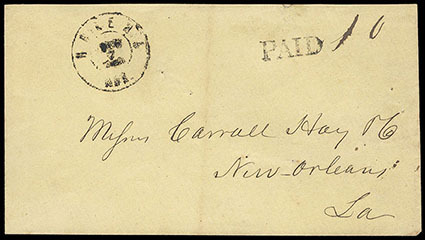 Confederacy, (Florida) Florida Stamped Postal History, group of 22 covers with a variety of frankings comprising #1, 4, 7, 11 and 12, towns include Lake City, St. Marks, Pensacola, Madison C.H., Gainesville, Tallahassee, Quincy, Warrington, Monticello, ms. "Little River Fla", ms. "Sandy Ford", ms. "Stark"; mixed condition. 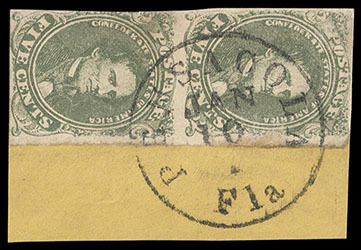 Confederacy, Florida Town Cancels, group of six comprising #1 with "Pensacola" cds on small piece, #1 with "Pensacola" cds (faulty with piece out), #2 with partial "Pensacola" cds, 1c olive green pair tied by "Pensacola Fla. Jan 10" cds on orange piece showing full cds, #6 pair tied by "Warrington Fla." on piece, and #12 tied by partial "Quincy" cds on small piece; some flaws, F.-V.F. and scarce group. Scott No. 1, 2, 5, 12 Estimate $400 - 600. Confederacy, (Florida) Lake City, Fla., Mar. 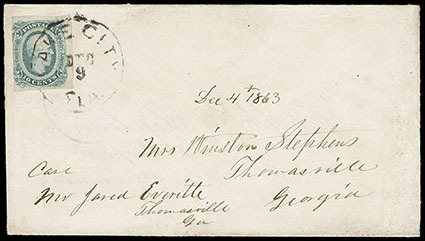 21, cds tying 1863 10¢ blue on adversity cover fashioned from lined note book paper and sent to Atlanta, Georgia., F.-V.F., Prior to the Civil War, this town was known as Alligator, Florida. Scott No. 12 Estimate $100 - 150. 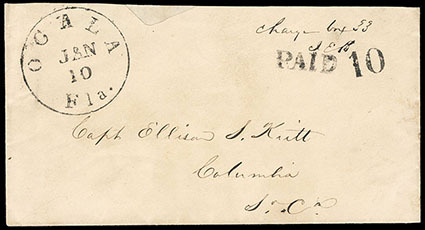 Confederacy, (Florida) Ocala Fla. Jan 10, cds with matching clear "Paid" and "10" rating handstamps on light buff cover to Columbia S.C., "Charge box 33" notation top right, top reduced slightly and edge repair, F.-V.F. 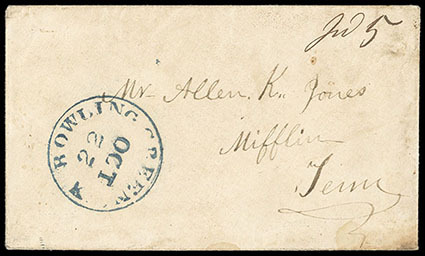 appearance, ex-John R. Hill Jr.
C.S.A. Catalog No. C Estimate $200 - 300. 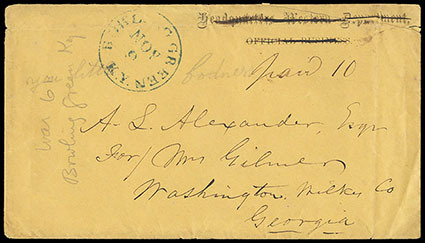 Confederacy, (Kentucky) Bowling Green, Nov 9, blue cds and manuscript "Paid 10" on orange buff "Headquarters Western Department, Official Business" semi-official imprint cover with imprint lined out and addressed to Washington Ga.; opening tear affects imprint, F.-V.F. 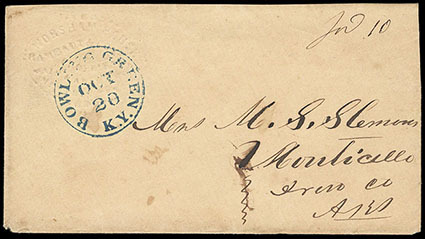 and scarce use from the Confederate post office at Bowling Green. C.S.A. Catalog $500 Estimate $300 - 400. The Confederates occupied Bowling Green on occupied Sep. 18, 1861. Confederacy, (Kentucky) Bowling Green Ky. Oct 20, blue cds and manuscript "Pd 10" rating on light buff cover with blind embossed Worsham House corner card to Monticello Ark. ; flap tears, F.-V.F. C.S.A. 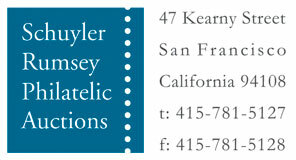 Catalog $500 Estimate $200 - 300. 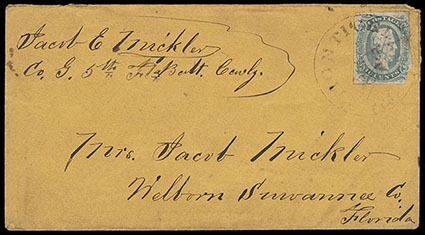 Confederacy, (Kentucky) Bowling Green, 22 Oct, clear strike of blue cds with manuscript "Pd 5" cents rating on small cover to Mifflin Tenn., pencil "recd Nov 3rd, 1861" on reverse; light staining, otherwise Very Fine and scarce use from the Confederate post office at Bowling Green.